He calls himself Granny Wolf and I decided he was OK, when I realised his profile picture includes a hyacinth macaw, a truly magnificent bird. And he has a most interesting take on Sikhi. Please read and enjoy, for a change! And you might even go and leave GW a comment. I think almost all bloggers love comments. (Hint, hint). 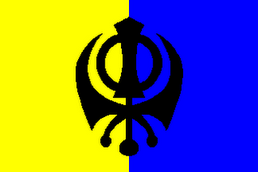 Sikhism is a tradition that I've always been fascinated with. The driving force behind the ideology is that Hinduism and Islam are essentially the same thing. In short, that the One and the Many are two expressions of the same divine substance. Ironically, the Sikhs have been portrayed as violent terrorists by most media sources, largely because they are a persecuted minority in both India and Pakistan. Tensions between the Muslims and Hindus and the Sikhs long predates Muslim/ Hindu conflicts in the history of Greater India ( i.e. pre-partition South Asia). The plight of the Sikhs in India and Pakistan is one of the passed-over tragedies of the modern era. When the INC began to break up Greater India into two nations, one Hindu and one Muslim, there was briefly a plan for a nation called Khalistan, which would be an exclusively Sikh homeland. This plan was scrapped, as the Sikhs simply were not politically powerful enough to secure their nation, but the idea resurged in the '70s and '80s. This movement was quickly stuck with the terrorist label, and violent government oppression effectively crushed it. Sikhs in North America were providing a great deal of support until the bombing of Air India Flight 182, which completed the symbolic link that the media, at the behest of the Indian government, was trying to create between Sikh nationalism and terrorism. Inquiries into this incident still take place to this day, and it is clear that CSIS (Canadian intelligence) was heavily involved. Based on the amount of documentation that they destroyed (156 of 210 wiretaps), the assassination of the only witness who would testify that the agency had full knowledge of the bombing before it happened (Tara Hayer, confined to a wheelchair after being paralysed by an assassins bullet in 1988 and finally killed in 1998), and the ridiculously drawn out inquiry which, after almost TWENTY YEARS of taxpayer-funded investigation, failed to produce a meaningful sentence of relevant data, I frankly believe that CSIS either planned the whole thing, or intentionally allowed it to happen. According to Hayer, the agent that he talked to claimed that the bomb was supposed to go off in an empty plane in Heathrow airport. Because the flight was delayed by three and a half hours, it blew up over that Atlantic, killing 329 people. Needless to say, this devastated international support for the Sikh separatist movement, removing the threat to Canada's Indian allies. India's attack on the Golden Temple had a radicalizing effect on Sikhs world-wide, much as Britain's attack on the Ottoman Sultan caused Indian Muslims to revolt against British rule during World War One. Not only did it strike up a strong political current for Sikh nationalism, but it caused many Sikhs who had departed from orthodoxy to return to the customs of their religion, which they saw being threatened on an essential level. 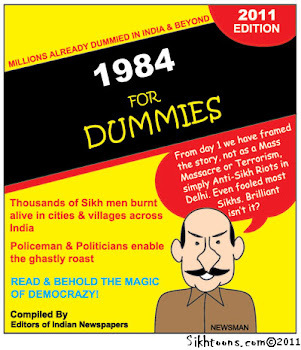 Operation Blue Star claimed to be an effort to capture "terrorists" who had "taken control of" the temple. The tyrant, as we well know, always calls the rebel a terrorist. The argument that Sikh nationalist Jarnail Singh Bhindranwale qualified as a terrorist leader was tenuous at best, (especially in light of the fact that the Indian military also attacked twenty five other holy sites, massacring Sikhs who had come to celebrate their religious festival) but no one could argue with Flight 182. Although ostensibly not part of the original plan, the deaths of a few hundred innocent civilians was certainly a strategic bonus for India and its allies. Ultimately, nationalism is a sign of sickness and weakness. Sikh separatism, Palestinian Nationalism, Italian and German Fascism, Tamil Nationalism in Sri Lanka, and so on, would be unnecessary if the classes of people in question had some kind of organic role in their larger societies. As it is, the Sikhs in Greater India, the Palestinians in their own homeland, the Italian working class, the German middle-class, and the Hindus of Sri Lanka have all found themselves beyond the pale of their own cultures. Demographically significant enough to have their own communities and agendas, but politically impotent. This is what creates the need to separate and divide the civilizations of man.